When I was still a young man my father handed me his rifle and one bullet. He said “bring a deer home or don’t come home.” Now to some that might seem cruel. To me it was a challenge. By the time my father said that, I was good with a rifle, actually very good. He was actually kidding. Well, sort of kidding, we really needed the meat. So I traipsed out into the snow to get some meat. I came home a few hours later dragging a buck behind me. I always enjoyed hunting. The time in the woods by myself, the skill in tracking the game, testing myself, pushing the limits. After I got older and served and did some other things I lost my taste for hunting but not for venison. So when I can get my hands on some I love to make it in new and interesting ways. 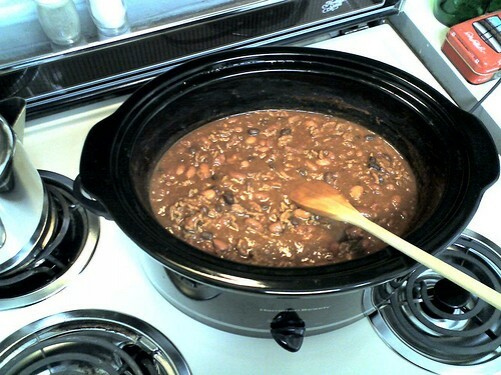 Here I have included my recipe for venison chili, crockpot style.